Truth be told, there are way more than five reasons why people from all walks of life can’t help but fall in love with sushi. For starters, sushi can be quite healthy, depending on what you decide to put in it. Sushi also comes in different shapes, textures as well as ingredients, making it one of the most complex foods on any menu. Since most people are usually engulfed in work with absolutely no time cook, they can always rely on a quick bite of their favorite sushi for their daily dose of a perfectly balanced diet. And the fun bit is that all this will be wrapped up in a burrito that can be eaten on the go. In case you have a clue about how to make your favorite sushi, you can always carry some to work for a bite or two. If not, then you can always enjoy some at your favorite restaurant during lunch break. More often than not, vegans usually find a hard time fitting in in a predominantly meat loving society. Thankfully, sushi serves as the perfect option for vegans all over the world. It’s not only tasty and nutritive but also an awesome way for vegans to feel included. It can be incredibly tiresome having to explain to everyone who raises an eyebrow about why you chose to be a vegan. Some of the ingredients that vegans can enjoy in their sushi dishes include tropical fruits, vegetables, soy sauce, pickled ginger, wasabi just to mention a few. Truth be told, you don’t need to every time go out and spend hundreds of dollars at a fancy restaurant for having your piece of Sushi. Getting a Sushi Machine to prepare this delicious dish at home is a more convenient and pocket-friendly way out! All you need is to learn how to use the machine the right way, and you’ll do just fine. You might struggle at first, but as the dictum suggests, practice makes perfect. You can also check on countless DIY tutorials on the web that can teach you how to go about fixing yourself a sushi meal at home. it’s quite impossible for anyone to make a buffet using a single meal. But with sushi, it’s a whole different ball game because sushi buffets are simply the best. Why is this the case? 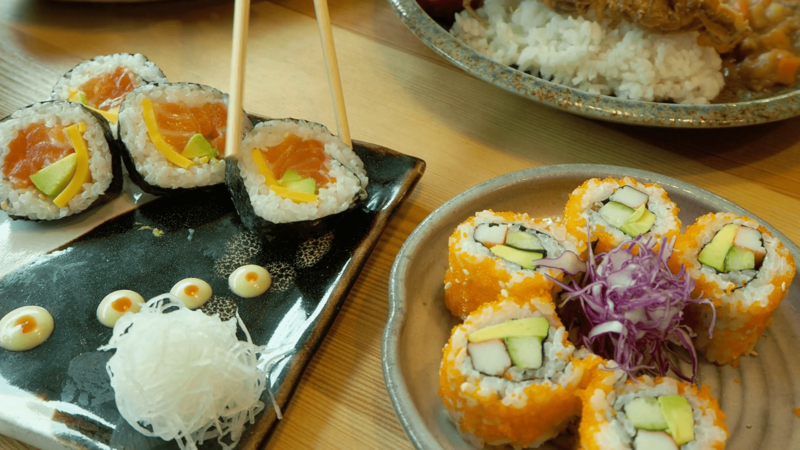 Because sushi, as well all know, comes with a beautiful mixture of quite a number of healthy dishes. This can only mean that you would never get tired of eating your sushi at a gathering, even if you wanted to. And thank God for the wide variety, you can skip from one sushi to the next, blessing your palate like you’re supposed to. Another reason why people find sushi irresistible is that of its uncountable combinations. Simply put, you can have your sushi however you like and still end up having the time of your life. Some people like their sushi salty, others like it spicy. Others like chicken sushi, others love fish sushi. In other words, everything you’ve ever wanted in a meal can simply be wrapped in a nice, happy sushi cuisine. Apart from being healthy and having something for everyone, sushi also comes in vibrant colors. And as we all know, how our food is presented to us matters a lot because our appetite more or less depends on it. Therefore, you can feel free to either learn how to make it yourself or even better, you can locate a good Chinese bistro and make a point of stopping by from time to time in a bid to enjoy your healthy cuisine at pocket-friendly prices!